Weather systems are lining up over the Pacific Ocean that have the potential of impacting central Indiana through the Thanksgiving holiday weekend. 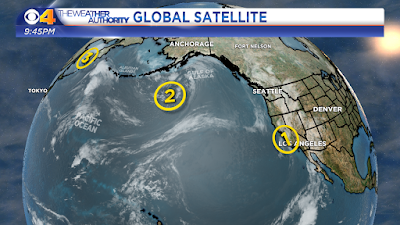 As of Sunday night, there are three that I am tracking three on satellite imagery. 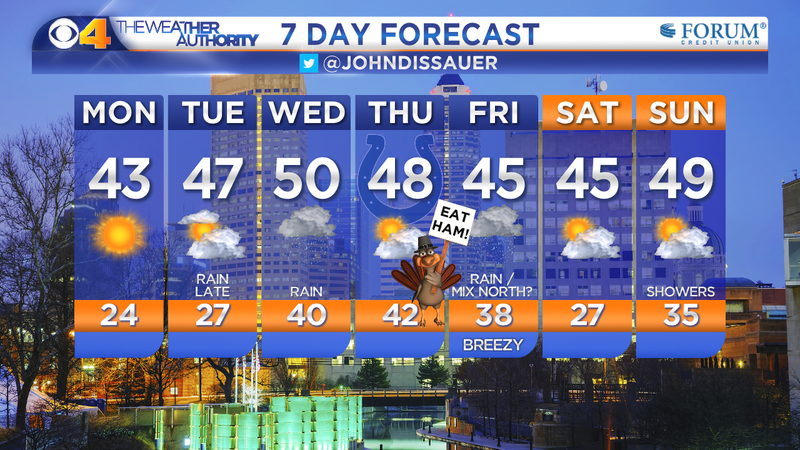 This one will bring rain to Indiana as early as Tuesday night and continue through Wednesday. Computer models are still working the calculations on this one. Saturday the data suggested the upper-level energy could pass through the Midwest as a clipper – bringing rain and then cold air to Indiana, changing some of the rain over to snow – for Black Friday. 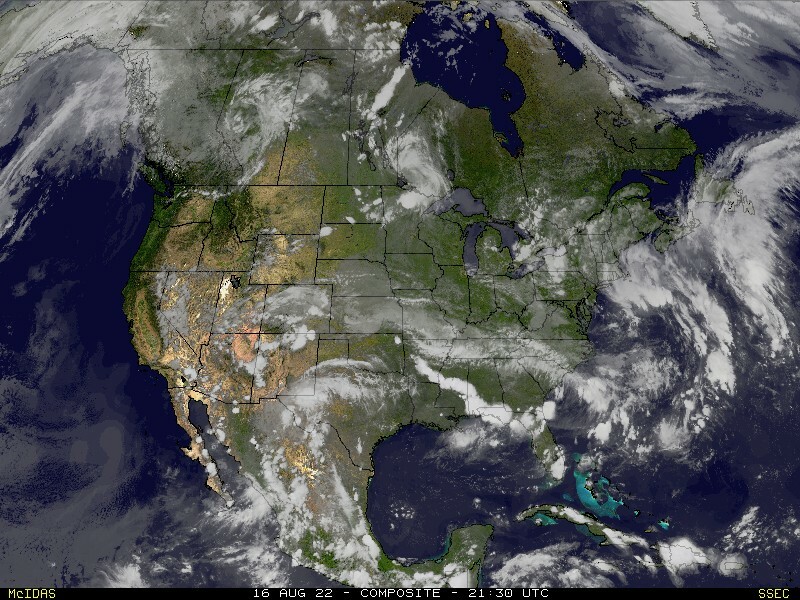 Sunday’s run of computer models suggest an area of low pressure in the Rocky Mountains and it will move east through the central United States. In this scenario, rain for Black Friday would be the primary issue as temperatures look to stay warm enough to keep everything in liquid form. However, on the tail end of the rain, there could be wintry mix. Long range computer data brings this system in to the Midwest late next weekend/early the following week. Looking waaaay out, computer models are indicating a strong signal for a larger storm to impact the United States November 28 through December 1. To trace the origin of this storm, you have to look off the northern Siberian coast over the East Siberian Sea. 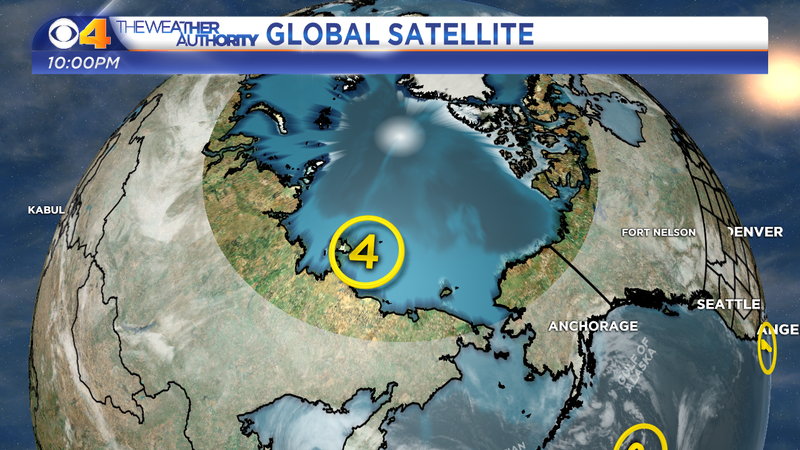 So far north, it is more difficult to get satellite imagery. As with most long-range forecasts, we will continue to monitor trends and see if whether or not some of these storms – especially #3 and #4 – happen or not. 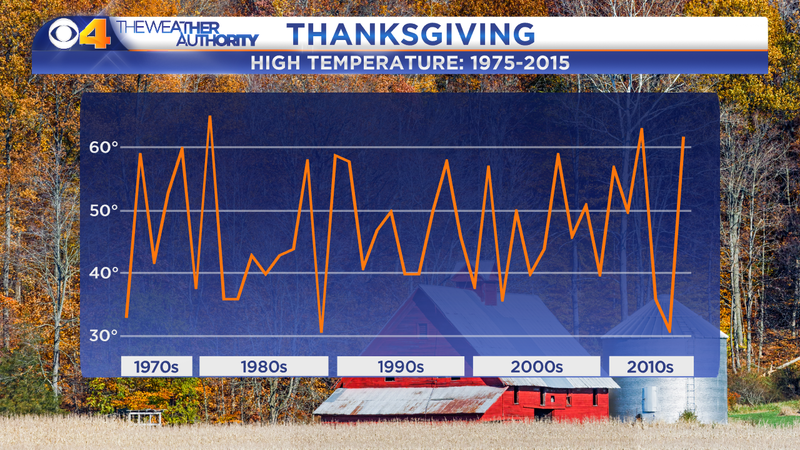 Over the last 40 years, the average high temperature in Indianapolis for Thanksgiving is 47°. Coincidentally, we are currently forecasting 48° as the high temperature Thursday. 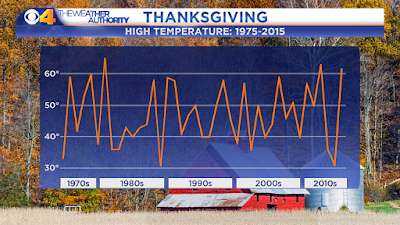 Through Saturday, November 19, this November ranks the 9th warmest in the previous 145 years of records. As we go through the remainder of the week, temperatures are forecast to be near normal if not slightly below.